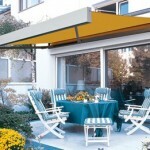 The Cassette Awning with a wall seal. The Markilux 3300 boasts simple elegance yet high stability and lends itself to domestic and commercial settings. The markilux 3300 is available with a maximum width of 700cm. The maximum projection is 350cm. The robust cassette design and the tight seal to the wall make the markilux 3300 a popular awning for commercial applications. 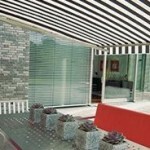 The double gutter allows water to run off to the side both when the awning is open and when it is closed. The awning is delivered pre-assembled. All screws and assembly components are made of corrosion-resistant stainless steel, the arms run in Teflon-coated brushes. The roller tube has a diameter of 85mm. The Markilux 3300 has been powder coated for long-lasting attractiveness and durability and the cassette is self supporting made of extruded components. When closed, the folding arms are protected from the weather by the cassette, making certain your awning maintains is high quality appearance over the years. 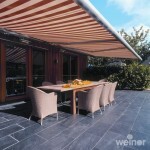 The 85mm roller tube ensures the highest rigidity and best possible cover for shade and wind even at the largest widths. The Markilux 3300 frame is available in three different standard RAL colours and a range of non-standard colours, known as the Lounge range. The 3300 cover is available in any of the colours and styles from the large Markilux fabric range. For domestic use, the popular Sunsilk collection lends itself to this awning as the colours are delicate and create an impact and ambience in your garden. For commercial use, we recommend the Sunsilk Perla FR fabrics. These are a collection of coated fabrics with a milky white underside. The fabric is waterproof and highly flame retardant, and should be used where fire safety regulations are in place and if protection from wet weather is a priority. The Markilux 3300 pur is technically identical to the 3300 and offers the same great features, however it has a straight front profile. The Markilux 3300 comes manually operated as standard with a markilux stainless steel winding handle. On request a hard wired electric motor or radio-controlled motor with markilux remote control operation can be fitted. There is a wide range of Markilux accessories to chose from, to personalise your awnings and make it tailored to your needs. Lighting, heaters and wind & light sensors can be added to the Markilux 3300 awning to keep you warm in the cooler evenings or to open or close depending on the weather. 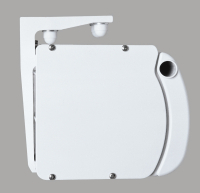 View Markilux Accessories here.